The Chicago Metropolitan Agency for Planning (CMAP), created in 2005, unveiled the GO TO 2040 comprehensive regional plan for Northeastern Illinois in 2014. 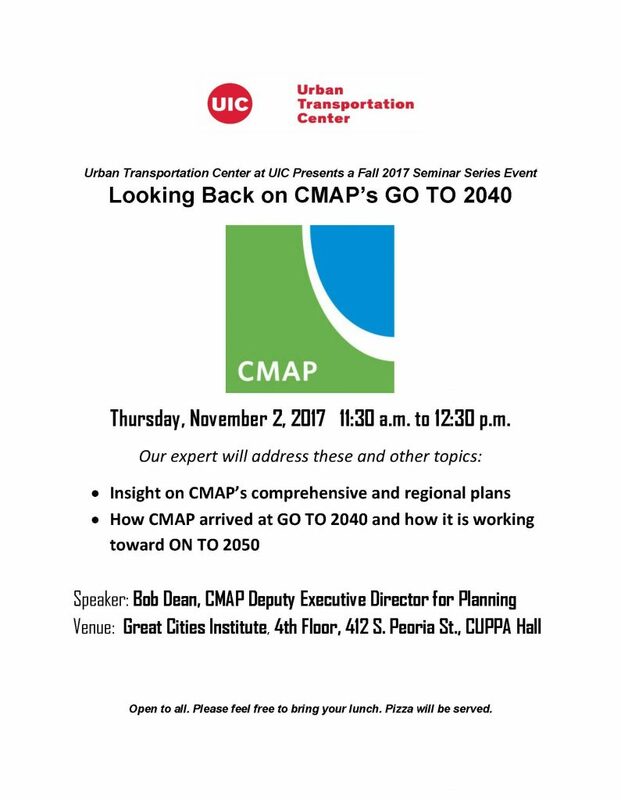 On November 2, Bob Dean, CMAP Executive Director for Planning, will share insight on GO TO 2040 and the under-development ON TO 2050, CMAP’s future comprehensive plan. The presentation is part of the Urban Transportation Center’s Fall 2017 Seminar Series. It will be held from 11:30 a.m. to 12:30 p.m. at the Great Cities Institute Conference Room, CUPPA Hall, 412 S. Peoria St., Chicago. The event is open to all.